Aesthetically pleasing pyramids create interesting effects, beautiful reflections, and patterns of light that add drama to your inner and outer décor. Provides your home with distinctive architectural flare. 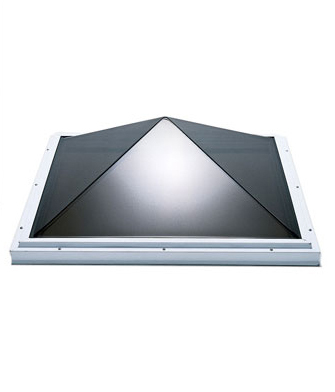 This skylight can be installed on flat or sloped roofs. The four surfaces of the pyramid slope upwards at an equal angle, of approximately 30 degrees, to a central point. There are no structural framing members other than the base. This type of skylight can be installed on all types of site built curbs, whether pre-existing or new. For additional weathertightness, ensure you use roofing membrane in addition to flashing system on the curb. For typical residential application Vinyl Curb Mount (VCM / OVCM) are utilized for skylights less than 5’ x 5’ and aluminum thermally broken curb mount (ATCM) for larger models. Commercial applications typically utilize the aluminum thermally broken outside fastening (AOF) skylight.